Home › Latest News › The Softail® Slim! Good day riders and soon-to-be-riders. 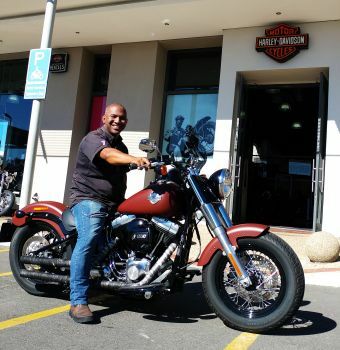 My name is Chesco and I am one of the Dream Makers (Motorcycle Sales Consultants) at Harley-Davidson® Tyger Valley! I've been riding a bike that's got me really excited, and here's why: I often find myself adding a windshield to almost all bikes I ride. My route to and from home takes me on the R300 and the journey is often extremely windy. As a natural instinct when riding in high winds, a person tends to hold on tighter and therefore becomes very tired from the ride. Having a windshield on any bike makes a notable difference to the ride experience! Over the last few days, I’ve had the opportunity to ride the Softail® Slim and have truly enjoyed the experience. The Harley-Davidson® Softail Slim is an amazing ride: it is quite a low bike which does wonders for my riding comfort and confidence. I am sure footed when needing to stop and move the bike into tight spaces and can easily manoeuvre in everyday traffic scenarios. But the main thing I’ve noticed while riding the Slim, is how well it handles in high winds (even without a windscreen)! The bike is sturdy and smooth and doesn’t leave me feeling exhausted from my 28km ride to H-D® Tyger Valley. So as one who almost always opts for a windshield, here’s a big thumbs up to the awesome Softail® Slim!